Adella Russell, formerly Adella Blackburn, was born in Berry Station, Alabama. Her mother died at an early age. She and her brother, Cleveland, were reared by their Aunt Anna Bell Hughes in Ft. Gibson, Oklahoma. Adella married Harry Russell from Corsicana, Texas. They moved to Indio, California, in the early 1920s. In the early 1930s, they moved to Riverside. 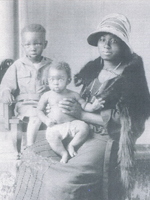 She and her five children: Loreena Mae, Anna Mae, Christine, Eva and Floyd were faithful members of the AME church.